Leapin’ Lizards! The irrepressible comic strip heroine’ ANNIE’ takes centre stage in one of the world’s best-loved musicals. With a cast of over 250 of the finest young performers from all over the Auckland region and a rocking live band, Annie delivers a magical night out for the whole family, in a not-to-be-missed, musical about hopefulness and family!Four shows only, and no extension is possible! Annie is the National Youth Theatre Company’s 29th production. Founded in 2004, NYTC is a Charitable Trust, bringing confidence and life skills to young people through the theatrical arts. 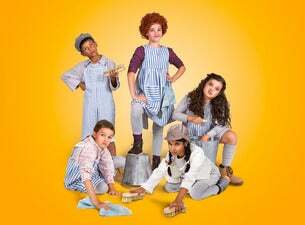 The outstanding cast of Annie includes emerging talent discovered through NYTC’s Outreach programme, which provides scholarships to students who might otherwise not be able to experience the joy of participating in an NYTC programme.